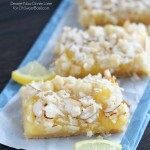 Coconut Key Lime Bars - Dessert Now, Dinner Later! Okay, okay! 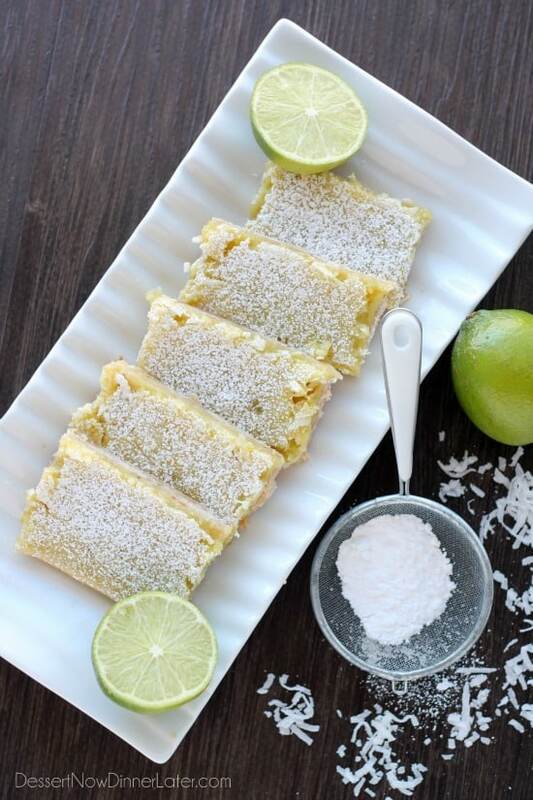 You might have thought I was done with my lime desserts…well, I’m not! Haha! I am obsessed, what can I say? I think I can say this is the last one, for at least this month. Haha. The good thing is, you have lots of choices and they are all top notch! 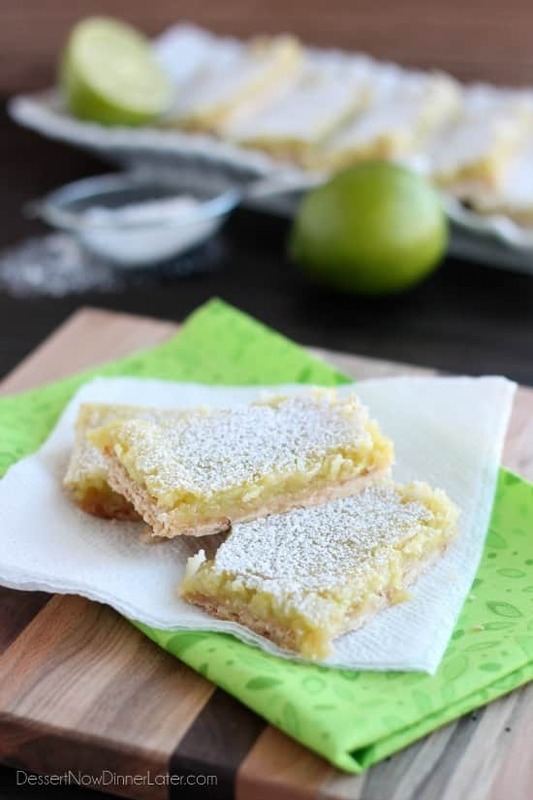 You can’t go wrong with any of my lime desserts, but these Coconut Key Lime Bars, have toasted coconut in the crust and regular coconut in the lime curd and so you are getting the best of both worlds! 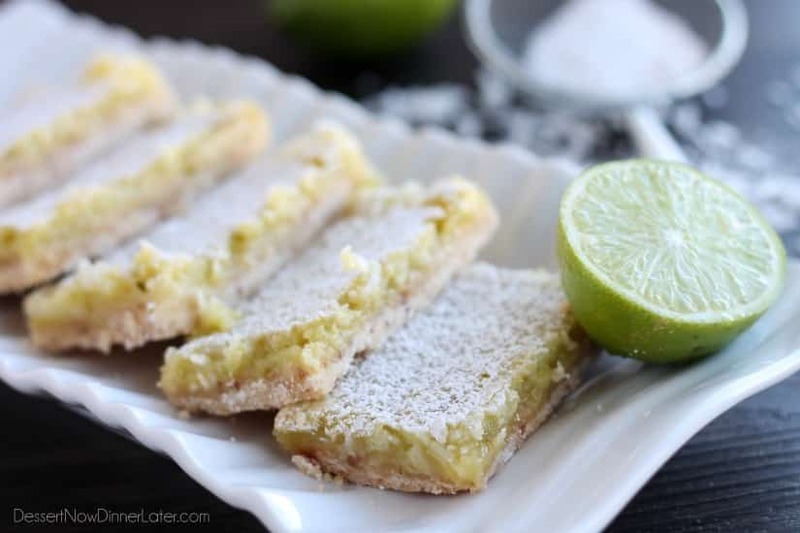 Did I mention that I love coconut-lime combos too? Oh I did? On Tuesday… when I shared my Coconut Key Lime Macaroons? Oh, you’re right! Sorry about that! 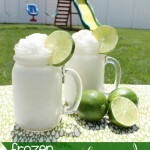 Well, not really, I just love lime and I love coconut-lime, so I am willing to shout it from the rooftops! Aren’t all of these citrus posts making you want summer to come, like right now? It has been unusually warm here in Utah. We usually don’t get out until April or May when all of the snow has melted and it’s finally 50-60 degrees Fahrenheit outside. Well, it’s March, all of the snow melted before the end of February, and it’s been 60 degrees several times in the last couple weeks. Our water supplies aren’t looking good for this summer, but man I really do love that vitamin D from the sun! I have taken my kids to the park every time it was nice outside. We are so much more cheerful when we get some fresh air. I love it! I am totally fine with rain, just no more snow please! My tulip and daffodil bulbs that I planted last fall are already out of the ground and getting big, so I am just in heaven with all these signs of spring. I hope it lasts! Oh and we totally fired up our grill a couple of times already as well. Those are my favorite dinners because my husband will cook. He is the grill master at our house! 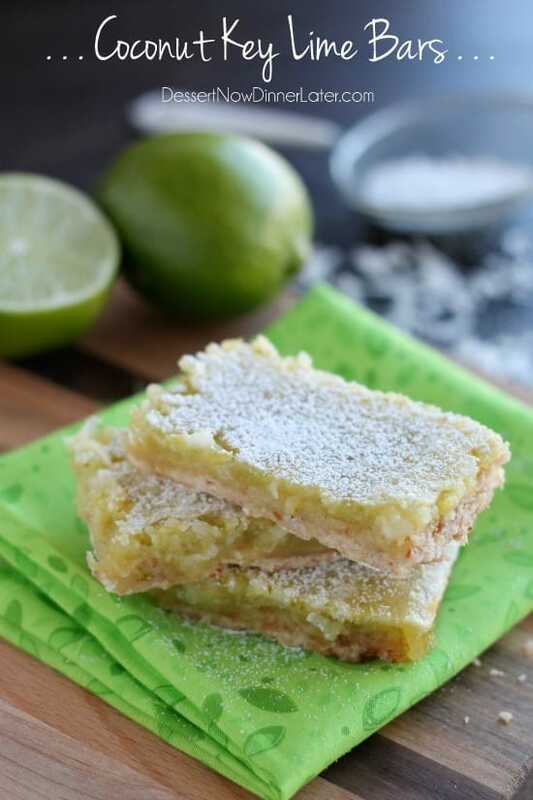 Anyway, these Coconut Key Lime Bars can temporarily take you to spring or summer with one little bite. So enjoy!!! Toast ½ cup of sweetened coconut flakes in a sauté pan on medium heat, stirring frequently until lightly browned. Be attentive! Once it starts to brown, it happens quickly. To make the crust: Combine the flour, toasted coconut, powdered sugar, salt, vanilla and butter in a food processor. Run/pulse the machine until mixture comes together/balls up. Press into an ungreased 13x9" pan and bake for 18-20 minutes, or until golden. Meanwhile make the filling: Whisk together the sugar, flour, and sweetened coconut flakes in a bowl. Add the eggs, one at a time, whisking well after each addition. Add the zest, key lime juice & enough green food coloring to produce desired color (A little goes a long way. I did a little bit on the end of a toothpick to get a really pale green color.) Mix until everything is smooth & combined. Pour filling over hot crust and return to the oven to bake for an additional 18-20 minutes. When done, the filling will no longer jiggle. Let cool completely in the pan before slicing and dusting with powdered sugar. For best results, keep refrigerated & serve cold. I want some of these!!!!! 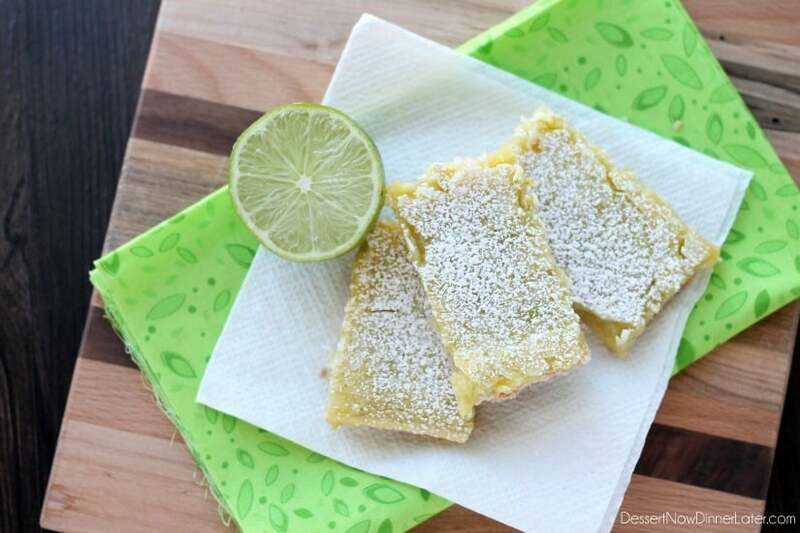 I love all of your lime desserts, so as far as I’m concerned – keep ’em coming!! Pinning! Yum! 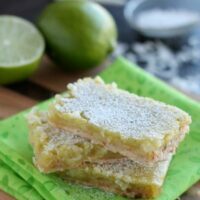 I am loving all these lime recipes. Lime makes everything better! No apologies necessary. 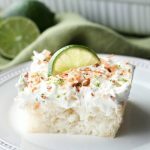 I’d be happy if you posted a key lime/coconut recipe once a week. These sound and look great! I am in Florida visiting my mom and sister and I had a piece of Key Lime pie yesterday and you are right, it just sings summer and warm weather. I’m with you, I hope the snow is gone. I will be here a couple more weeks, but I don’t want to see snow when I go home. Great recipe, as usual. 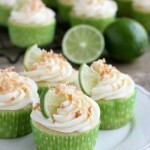 Now you are making me want key lime pie! I love that too! Wow these look absolutely delicious. Cant wait to try! I think you left the butter out of the instructions. I’d guess it goes in the crust because that only makes sense. Making these now so that’s what I’m gonna do (fingers crossed)! My bad! Thanks for catching that! I hope you got it to work out! And yes, it goes in the crust. It worked out! 🙂 Yummy recipe! I’m so glad! Thanks for the update!